Brand new real estate investors are always worried about filling out the Sales and Purchase Contract even before they find their first investment property. And I will admit, it seems like a big deal until you have done it a few times. But the truth of the matter is that folks tend to make it harder than it really is. It's actually a pretty simple and straightforward process. I have made a short video so that you can see first hand just how easy it is. If you plan to “assign the contract”, I have gone over that too. What Needs to Be Included In a Sales and Purchase Contract? You need to spell out everything in detail; there should never be any assumptions by either party. I usually re-name my master contract as the name of the property and save it in a file I created called “Offers Submitted” on my computer. I think you can visualize how much easier it will be to find a particular address especially if you have 50-100 properties in your file. Hi, this is a very informative video. I was just wondering is this still a valid form to use in Ky in 2017? Hi Troy – yes it is. It’s still the one I use. 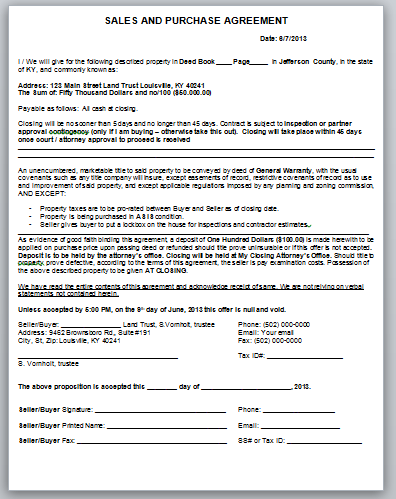 just researching about getting into wholesaling this week, and wanted to go over how the agreement is filled out. timing is everything. thank you sharon, your the best! John – I just did a post about a week ago on filling out a contract. It’s pretty simple; when you make an offer you fill out a contract. I will usually talk to them and verbally give the offer then fill it out when we agree. If you are at the site, then just fill it out there. I usually go back to my office, get my numbers together and call them back. Terry – I get a couple of people every week that email me that question, so I thought I would just make a little video using my (new) favorite free tool “Screencast-O-Matic”. The tip about the property addresses is actually one that I learned from my friend Mike Butler a long time ago. I can’t tell you how thankful I am that I list my properties that way. I save copies of all the contracts in my computer, and I save them exactly the same way. It makes everything really easy to find. Excellent video. Good explanaition on the how to fill in the contract. Also, I appreciated your tip on how you keep track of properties on your computer. Using the street name instead of the street number makes a lot of sense.